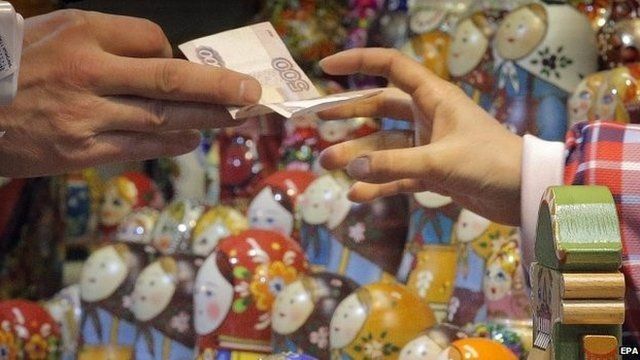 Simpson: What's behind rouble's fall? Jump to media player Russia raises its key interest rate from 10.5% to 17% in an effort to ease the rouble's recent fall in value. Living with Russia's economic gloom Jump to media player The economic gloom in Russia is growing. BBC News finds out what effect it is having on everyday life. Russia 'has more than just oil and gas' Jump to media player The BBC's Robert Peston asks former BP boss, Lord Browne, how worried we should be about the Russian economy as the rouble suffered its biggest one-day decline since 1998. Why does the rouble keep sliding? Jump to media player Russia's president has warned of "catastrophic consequences" if the rouble continues to slide. The BBC examines how we got here. The changing Russian menu Jump to media player After President Putin banned fresh food imports from the West, Russian menus began to change. Now, many believe the sanctions will boost the local economy. Rouble surges with hope of truce Jump to media player Russian shares and the value of the rouble have surged, thanks to that announcement of a permanent ceasefire in eastern Ukraine. Russian economy 'increasingly weak' Jump to media player Russia's economy could suffer long term damage if turmoil in Ukraine continues, an economist warns. The BBC's World Editor John Simpson reports from Moscow.